Watch our tamed racing driver Chris Harris flog the insanely powerful "El Camino-esque" Holden HSV Maloo GTS ute around an Australian race track and see why he reckons; there's no greater honor than introducing a very fast car that can tow [3,500 pounds]. Before the doors are shut forever at GM's Australian outfit Holden, the company is cranking out one last ode to the ridiculous-yet practical idea of a high-horsepower car with a pickup bed. Holden has had performance variants of their "ute" before, but only 250 of these HSV Maloo GTS trims with 570 horsepower and what Harris describes as "torque, torque, torque" will ever hit the streets. 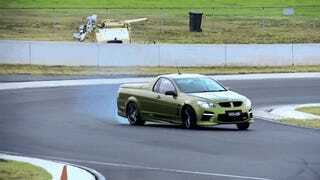 The only ute I've ever driven was a heavily modified Ford XR6; turbocharged to a paltry 400something horsepower. Hard to imagine what kind of chaos you could cause with almost 200 more and a skilled pilot at the wheel... but you don't have to imagine it, just watch it right here!